Nice theme.... and appreciating the support that was provided while purchasing the theme. Responsive layout makes this Game Portal WordPress Theme accessible from various handheld devices, whether it is a laptop, a tablet or your smartphone. Awesome jQuery and gallery scripts add more interactivity. Video integration and embedded audio player will leave a good impression on your website audience. This template is also equipped with the latest Bootstrap and Cherry Framework functionality features, which will facilitate styling and coding. 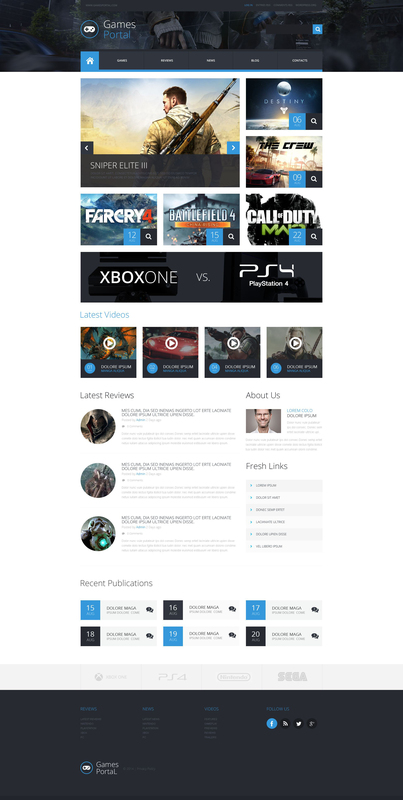 Can I resell the customized WP theme for Xbox Systems? After Games & Nightlife WordPress design purchase you can put your copyright to the template. But you cannot place a line at the bottom (or any other spot) of the customized project saying "Website design by Company name". Nevertheless, you can place "Customized by Company name". Instala&ccedil;&atilde;o simples com arquitetura robusta facilitou o trabalho e o cliente adorou a forma de navega&ccedil;&atilde;o os plugins funcionam bem para esse modelo. Is there a way to make the template wide screen, and not in the center of the screen?